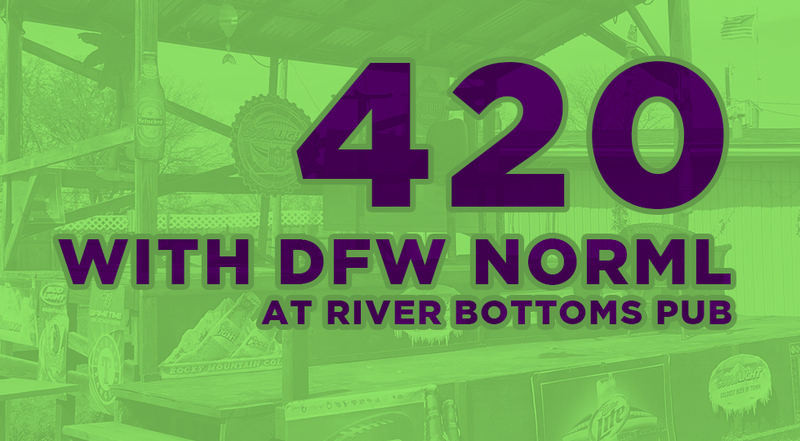 DFW NORML is hosting a 420 celebration on Saturday 4/20/19 at River Bottoms Pub in Fort Worth. Festivities include outdoor games, prize drawings, live music, vendor booths, food trucks, speeches, and a good time by all. Entry is free. Gates open at 2pm and the party ends at 8pm. More details to come including what to expect at 4:20 on 4/20. Mark your calendars and invite your buds to the only 420 party in North Texas benefitting the Dallas/Fort Worth chapter of the National Organization for the Reform of Marijuana Laws. Vendor booths are available for $200 with space for up to ten vendors and two food trucks. River Bottoms Pub is located at 7920 Randol Mill Rd, Fort Worth, Texas 76120.